Yeah, that line pretty much blew my mind away. I went from, I’m not looking at another book at ALA to I must read this NOW. Of course, so many books so little time, now is a relative term. Vicious by V.E. Schwab is vicious. It is viciously brilliant. As with any good book, I am kicking myself for not reading it sooner. Victor and Eli started out as college roommates—brilliant, arrogant, lonely boys who recognized the same sharpness and ambition in each other. The story is split between the present and ten years ago. The present tells of Victor, an escaped convict, who is determined to deal out revenge. Flash back to ten years ago and Victor is a bright, young university student who is practically inseparable from his best friend – Eli. In their senior year, a shared research interest in adrenaline, near-death experiences, and seemingly supernatural events reveals an intriguing possibility: that under the right conditions, someone could develop extraordinary abilities. But when their thesis moves from the academic to the experimental, things go horribly wrong. Ten years later, Victor breaks out of prison, determined to catch up to his old friend. I adored the complex friendship between the two men that hovered somewhere between admiration and bitter jealousy and how this developed as they grew and became more obsessed with power and their own view of right and wrong. I loved Schwab’s take on morality, mortality, and villainy. 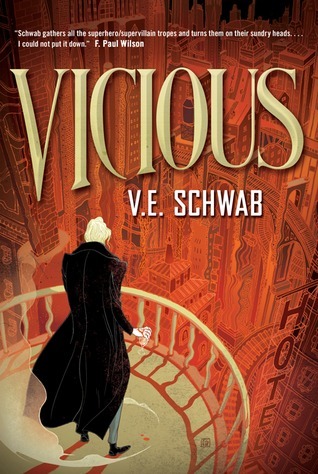 In Vicious, Schwab brings to life a gritty comic-book-style world but in her world there are no good men or women, which makes it even more deviously fun. While the book ends with a cliffhanger, I have it on good authority there will be another book. Can’t wait! This entry was posted in Adult Fiction and tagged Adult Fiction, V.E. Schwab, Vicious. Bookmark the permalink.